Each double page spread in the book will have a text panel with a corresponding animal; elephant and goldfish, parrot and sheep, rooster, cat, duck and bunny. This entry was posted in Animals, Bed Book Animals, Bed Book in Progress by Salley Mavor. Bookmark the permalink. Its face has so much character. Wow! Thank you so much for sharing this with us. When I first saw the picture of the camel I wondered how you made the hump. Thank you for explaining. It´s an amazing camel. I loved it. Seeing your work always brings a smile to my face. Thank you!!! I love the camel, but more than that I love the picture of you by the fire. That’s one I can walk right into. I remember how you said winter was a wonderful time to work for you. Now, I can begin to understand why. I am so excited to see the completed bed book – and so are my kids! Your Bactrian camel is so beautiful, but I wanted to suggest you double check its presence in North Africa. I am fairly certain that Bactrians are native to Asia, and dromedary camels are native to Africa. I live in Alaska and we are lucky enough to have a Bactrian, two hump camel at our zoo – it is actually hardy enough to live up here in the cold! Thank you for this information Anna, which shows sloppy research on my part. I may have to redo the camel to a one hump variety. Better to find out now, before the book is printed! So good that this involved simpler embroidery! This character is a keeper, to be put to other use – it’s true the camel of Africa is a dromedary, one-humped. Maybe you could keep this camel for Africa, by just filling in the gap between the humps, by adding a red felt carpet-covering, above the fringe … same for the little titch? or could that one stay a Bactrian camel? Yes, my thoughts exactly. I am reconstructing the camel into a dromedary at this very moment. I’m glad you made a smiling camel. They always seem a bit mischievous to me. What a handsome fellow he is! I love your critters, every one has it’s own distinct personality. 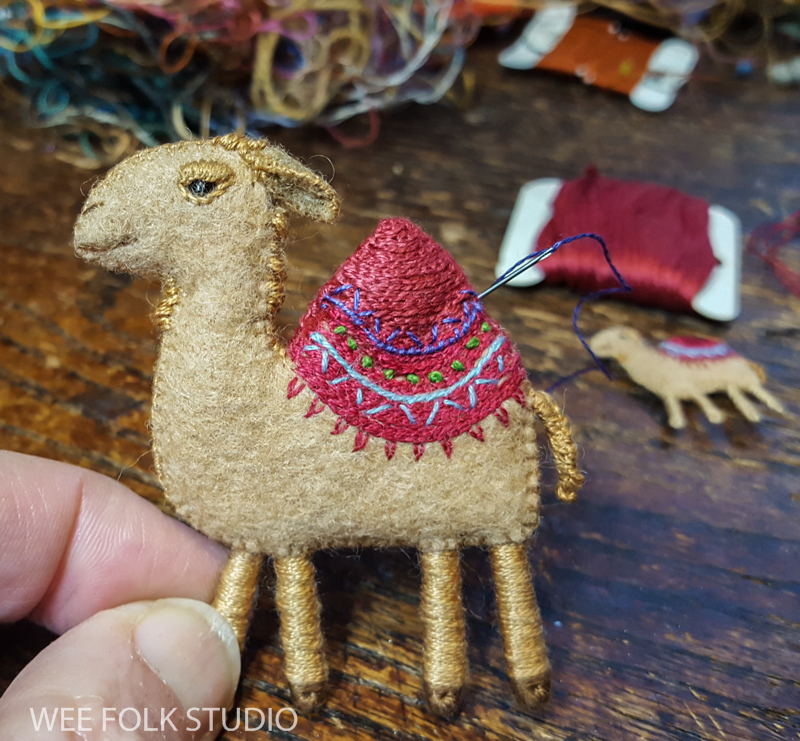 Love your camel and this wonderful time to work on these important stitcheries! Whether 1 hump or 2, that camel”s a beauty! Love its colors and texture. You know, it´s all those fine details that make your work so special. I love this little camel. Great to see your process, too. Thanks, Salley.